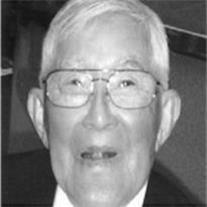 Paul R. Ishikawa was born in Florin, California on March 16, 1914 and passed away on June 14, 2011 in Mesa, Arizona at the age of 97. Paul farmed in the Lehi area of Mesa for several decades, harvesting a wide variety of fruit and vegetables, including the sweetest oranges ever grown in Arizona. He was preceded in death by his loving wife, Sally Sueko, his parents and seven siblings. Paul is survived by his five children, Sharon (George), Paul Jr., Brian (Nancy), Mark (Iris) and John (Sadie). He is also survived by his eleven grandchildren, Tonya (Dave), Tara (Augusto), Kelly (Nicki), Michele, Megan, Ryan, Lindsey, Chelsea, Matt, Nick and Trey. In addition, Paul leaves five great-grandchildren, Joshua, Sam, Tyler, Caleb and Finn, and numerous nieces and nephews. The Ishikawa family is deeply indebted to Jade Hart, Paul’s devoted and loving caregiver these past several years. Visitation will be held on Sunday, June 19, 2011 from 5 to 7:00 p.m. at Bunker’s Garden Chapel, 33 N. Centennial Way, Mesa, AZ. Services will be held on Monday, June 20, 2011 at 11:00 a.m., also at Bunker’s Garden Chapel. In lieu of flowers, donations may be made to Hospice of the Valley, 1510 East Flower Street, Phoenix, AZ 85014-5656.